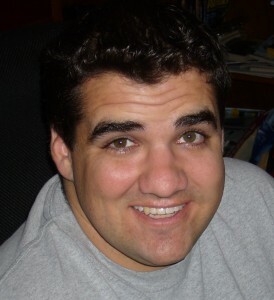 A native of Orange County, John Crandall works as a freelance reporter for patch.com, covering a number of cities in southern California. John also writes a weekly humor column called Give John Crandall a Dollar. Besides Stuck Station, he is currently working on a Monday-Wednesday-Friday webcomic that he draws and co-writes with his brother Michael. John plans, Lord willing, to start publishing the webcomic sometime this year. A follower of Jesus, he would love to talk to you about how you can have a personal relationship with God. John loves writing, webcomics, surfing, and racquetball. But not long walks on the beach.